I remember as a boy my father introducing me to myths of the Norse gods. Although they were told to me as pure fiction, they resonated with an identical primal, religious truth to the Biblical stories that pervaded my Catholic upbringing. Over time I developed a more nuanced understanding of fiction not merely as a vehicle for entertainment but a purveyor of deeper truths. Nowhere is that truer than with tales that transcend a single telling and earn the loftier title of myth. The difference may be nothing more than that they are a mongrel amalgamation of retellings, more powerful than any single story or storyteller. Neil Gaiman’s work has always been infused with the ancient myths, particularly his most literary works, The Sandman and American Gods. 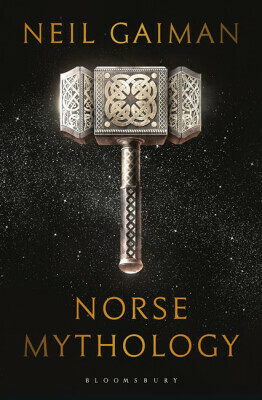 Now he is releasing his retelling of the tales with which I (and he) grew up in a volume titled simply Norse Mythology. The muted black and gold cover feels less fantastic than the artwork adorning his past fictions and the black-edged paper of the signed first edition produces a sombre, earthy tome. Mjöllnir weighs heavily on the cover though the book thankfully lacks its heft. Of course, another Gaiman book meant an another launch event and another chance to hear him speak, this time in a packed out auditorium at the Southbank Centre. The larger audience meant that the evening was host to some big announcements. But I’m getting ahead of myself. Gaiman chose to open with a reading not of the topical tale of The Master Builder (which he paraphrased as Odin deciding to build a wall around Asgard to keep the frost giants out and, essentially, making them pay for it…) but rather with Freya’s Unusual Wedding. His respect for the oral tradition that begat these tales is evident in the punchy short sentences and in the humour that suffuses his versions. They originated, he noted, in an oppressive part of the world where in the summer the sun barely set and in the winter it barely rose — in either case the solution was to get drunk and tell stories round the fire. These are stories that deserve to be told out loud. When asked what stories he thought he would survive in the next thousand years, he saw limitation in the fact we tend to read rather than speak and retell our biggest stories. Whilst he would love to see The Hitchhiker’s Guide to the Galaxy still being read, it would require similar study to reading Shakespeare to unpack a simple joke about digital watches and their relevance at a specific point in time during the transition from analogue to digital. Which would almost certainly ruin the joke. Instead, he decided he would be happy if, in another thousand years, we were still telling the Norse myths. Perhaps we are in an age when we contribute new ideas to an existing canon of characters and keep them moving forward, polishing, refreshing and renewing them. Think of comicbook superheroes updated for each decade, Sherlock reborn in the modern world. Gaiman himself has done so with The Sandman‘s Dream and Death being touchstones for countless modern writers exploring those same Eternal characters. He revealed a considerable amount on various other projects too, With a lot of his work being translated into other media, it’s a great time to be a fan of his work. We saw the latest trailer for the forthcoming Starz adaptation of American Gods (which is likely to be released through Amazon Prime in the UK). Meanwhile the Good Omens film is progressing, with a director to be selected in the next month or two, followed by casting. He mused on the emotional experience of writing those characters without his co-author Pratchett to call on, a film that he wanted to see made but will never get to view. A bigger surprise was a previously unscreened trailer for an adaptation of the short story How To Talk To Girls At Parties. The story drew from his proto-punk youth in 1970s Croydon which is readily apparent on screen. It is due to be released this summer and the cast includes Elle Fanning, Nicole Kidman and Matt Lucas. Hopefully you will see the trailer before too long, once it is polished and the sound mix finalised. However the biggest news of the night, on which the event closed, was a simplest. 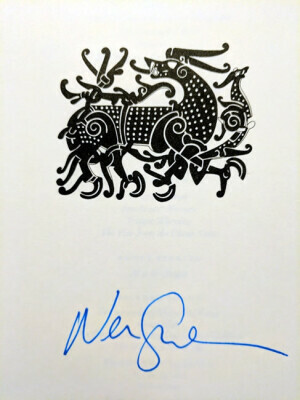 Gaiman revealed that he is now a solid three chapters into writing The Seven Sisters, the sequel to Neverwhere. Cue raucous cheers and applause. It was only right that he reveal it here in London. The city has changed in the 20 years since Neverwhere, and it’s high time we returned Below.